I was trying to do accept() and listen() in a non-blocking way. Pseudo code is below. TCP connection establishment is a three-way handshake, see below. Actually it is a 4-way process, but usually server will combine both SYN and ACK in a single packet, so three way handshake. 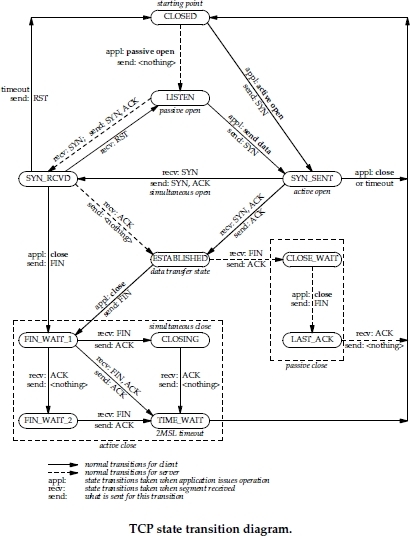 Client initiates the connection request by sending the SYN, this is what happens when it calls connect(), then it waits for ACK+SYN from server, when client gets ACK+SYN packets, it sends ACK packet and moves the socket to ESTABLISHED state, see TCP state diagram below. Only point at which client has to wait is when it waits for ACK+SYN packet from server, this is indicated by EINPROGRESS return code from connect() call. When fd returns from select(), indicating ready for write, it means either some error happended or ACK is send(3-way handshake done) by client in response to ACK+SYN packet from server, we can check for error using getsockopt() call, if no errors then client socket is in ESTABLISHED state, ready for send/receive packets. Client need not call another connect() to ACK the ACK+SYN packet from server, it will be done by the stack/kernel. Actually accept() works in a different way, stack/kernel is the one doing the 3-way handshake and then new connection availability is notified to the application(server). 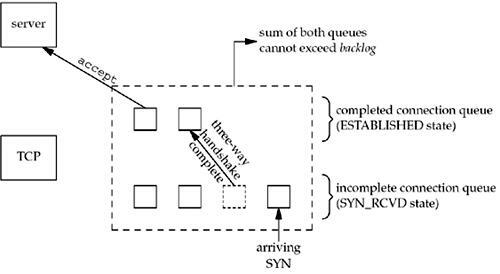 TCP stack maintains two queues, one incomplete connection queue and one completed connection queue. Connection which are in SYN_RCVD state(i.e. 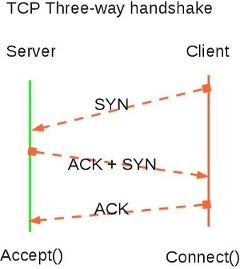 send ACK+SYN packet in response to SYN from client) are in incomplete connection queue, connections which are in incomplete connection queue are moved to completed connection queue when it receives ACK from client in response to ACK+SYN. Accept() will be successful only if there is any connection in completed connection queue, select() will return ready for read only if there is any connection in completed connection queue. So Accept() is not the one which does 3-way handshake, but it simply returns new socket fd, if there any connections in completed connection queue, so our pseudo code will work correctly.